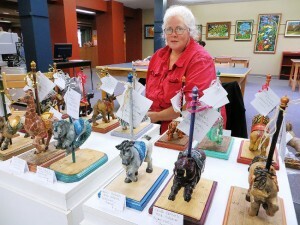 Alison Barclay is a woodcarver who goes beyond the expected. Her colourful and unique bird houses and feeders are built for years of hard use, contain all the necessary fixtures, and add a touch of whimsy to any garden space. Alison’s sense of humour and delight in the ‘childlike’ is carved into her fantastical “gnome doors”.